Doesn'tseem to be much info on that vessel, I did see one reference to a ship of that name and spelling, it was a whaler, sailing out of Liverpool, in that era. Are you sure that it wasn't spelled Ballina, therewas a vessel of that name, but that was at an earlier time. Try the Merseyside Maritime Museum and the Belfast Harbour Office, their archives might have some info. There are several places where records of the ship might be found, and a couple of sources which may mention him by name and at least one of those latter sources is publicly searchable but that needs some bio info about him. Another point is that he was entitled to be awarded a Merchant Marine medal but they had to be applied for and if he didn't apply for his then his next of kin can still apply for it. sonofshanks has to have a photo of it, he might post it for you. That could be a very good clue from Moorfield Street but the dates of the ship don't fit in with your relative's WW2 service but he might have served on more than one ship. I've only seen one reference to the Balina spelling and I can't find that vessel on Lloyd's list so far, I found similar names and also names which included Balina as part of the name, but no exact matches for a ship of that name and type. That doesn't matter overmuch at present, nor does the ship's date mismatch, and in any case, the best potential lead in regards to the ship issue may be Moorefield Street's mention of the name of the shipping company. Moorefield Street's information relates to a comment that I made elsewhere recently, in which I said that it's sometimes the case that when you look for something and can't find it, that may be a clue to what the true situation really is, and currently I was and am wondering if Balina is the correct spelling or even possibly, the full name of the ship, when you look for mention of a ship it's very unusual not to find at lest several references for that ship. There are two issues here, the ship, and the seaman, and as regards the seaman, it should be possible for you to find lots of information about his Merchant Naval history, from several sources. The best one stop shop for such sources is on the links below, at the Registry of Shipping and Seamen (RSS), some of the relevant sources can be pursued via telephone and post, but some will probably require either boots on the ground or the paid services of a resident archivist, that should keep you occupied for a few weeks. Some of the sources refer to the Public Records Office, that is the U.K. National Archives at Kew in London, and their file reference system is an unintuitive and obscure maze to try to negotiate, I'll try to give you a bit of help with that later. Your relative isn't listed on the Merchant sailors personal documentation or crewlists that are publicly available, but not all of those records have been publicly published, so the Southampton Archives are still worth pursuing. Some terms that you may encounter, Board Of Trade, = the forerunner of the British Ministry Of Transport, the body responsible for all matters pertaining to Merchant shipping and Merchant mariners,...CR = Central Register Of Shipping and Seamen, = a set of records which were originally created and administered by the Board Of Trade,...BT = Board Of Trade. Note,...anyone who is reading this and who is is interested in researching WW1 and pre WW1 merchant sailor ancestors should be aware that the term Merchant Navy was only granted to the British merchant marine service shortly after the end of WW1,...also,...it's not to be confused with the similar term which is applicable to the American merchant naval service, i.e. the Merchant Marine. Download and read their information leaflet "Information leaflet/historical records" that will tell you what records are available and where to find them. This is the download link for that document, which is in Windows Word DOC format. There aren't just two issues involved here as I previously said,...the ship, and the sailor, there is also a third issue,...his medal entitlement, because I have just checked and there is no record of any WW2 medals having been issued to him, but as I said above, those medals weren't issued automatically, they had to be claimed, and if he was entitled to such medals but didn't claim them, they will still be claimable by his next of kin. So when you view the above page on the RSS site, also enquire if there is any record of medal entitlement OR issue for him. Which reminds me of a very remarkable woman who I had contact with who is severely dyslexic but hugely determined and she is a frequent visitor to Kew and to other London sources and she was also looking for merchant sailors records, and she found them, and a lot of other stuff as well, and she's even planning to write her biography. ! Forgot to mention, it's also worth buying this book, or obtaining it from your local library system, it's also available in e-book format. It gives an excellent account of what conditions were like for merchant mariners in those waters in that era. Somebody screwed up here, and it was me, in my first comment about finding a reference to the Balina in, "that era", I've checked that source in more depth now, and that reference wasn't to the WW2 era, it was to just in or shortly after 1952. That will teach me to follow my own advice and check my "facts" "properly". ! I strongly suspect that the ship which was being referred to in that source was, as Moorfield Street, almost certainly correctly suggested, the Balaena, and that the name was misspelled as the Balina. Furthermore, there are WW2 movement records available for every British merchant vessel and I've checked them and there is no record listed for a vessel called the Balina. Also, amongst references to such things as plums, and the Prime Minister of Jamaica, the above source also contains, ( amongst a lot of other information about the "Balina", this telling passage,...( which BTW is an account partly from, and partly about, one of the crew members of the "Balina".
" " Everybody, believe it or not, in those days wanted to go whaling. Kudos or something. They weren't all seamen, they were all kinds, in particular a lot of Irish chaps from the shipyard where the ship had been built, called the 'Balina' ". He must have pulled the right strings and KO had a telegram from the Hector Whaling Company 'can you join 'Balina' in Liverpool' on some date." "
There is also a 1947 documentary film which features the Balaena, and which is available in Glasgow. You might want to talk to a Norwegian guy called Trygve H. Christensen, his father was one of the ship's officers during the 1950's, you'll find Trygve's email address ( [email protected] ) and his comments about the Balaena on the links below, there was a Scandinavian ship of the same name but it seems as if he is referring to the British registered vessel, you will also find messages from at least one other former crew member. 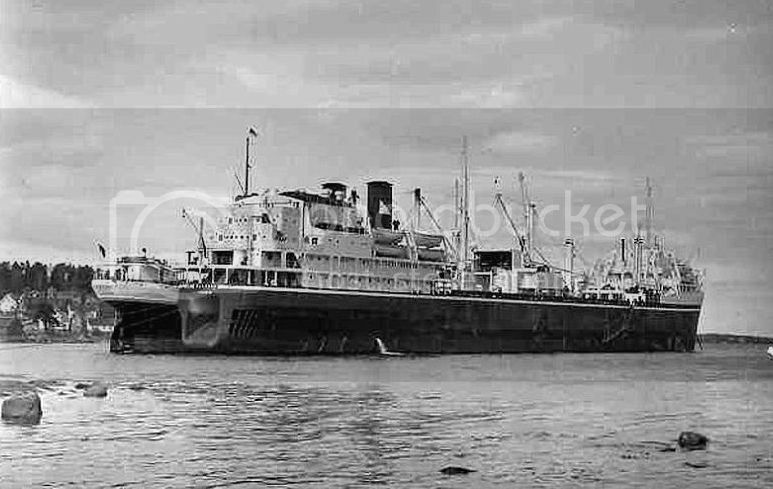 See link to photo of Balaena in Belfast History-Merchant Seamen N.I. Reply no.930 by Robroy, today. Here are a few photos of the Whaling Ship BALAENA. I must be more fuddled than usual, I wrote a message yesterday which included a link to the original source of that pic and I thought that I had posted it but I must have messed up and I have no idea what happened to it. I was right about one thing though, your information about the name of the shipping company was a crucial lead, there is loads of information available about the Balaena and about United Whalers Ltd.
Two of the company's whaling factory ships were sunk by German U-Boats in WW2, and both of the U-Boats were commanded by famous German U-Boat aces, one of the ships was built by Harland and Wolff. The Balaena had three Walrus amphibious aircraft which were used for whale spotting.